Happy Thanksgiving everyone! We know as soon as the dinner plates are cleared tomorrow, you're going to start strategizing your holiday shopping. Have fun out there in the Black Friday madness (those of you who choose to participate). But remember, those truly memorable, meaningful gifts come from real people...people like our Holiday Fair artists. As you're planning your gift giving, consider these two new gift guides to help you find the perfect treasures for the people in your life. Shave Soap by The Herb Garden / Hand-thrown Mugs by April Schwingle / Sketchbooks by Shed Labs / Hand-turned razors by Slab. If you're looking for unique and one-of-a-kind Christmas gifts this year, our Indie Craft Parade Holiday Fair can help! 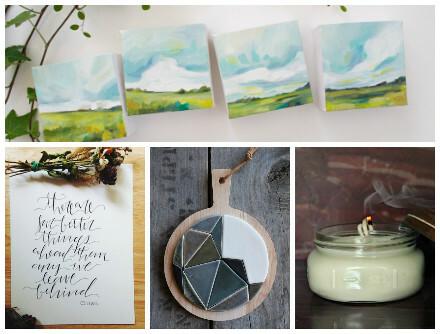 Featuring handmade goods from 29 artists, there's something for everyone. Starting with stocking stuffers and gifts for the little ones on your list, let us make a few suggestions to get you started! We are excited to announce the 2014 list of Indie Craft Parade participants! Our fifth annual festival will feature 80 artists — 33 new and 47 returning. Mark your calendars for September 12-14 and come see us at the Huguenot Mill at the Peace Center. We know you can't wait to start shopping, so go check out the complete list on our website, and start making those wishlists!